This paper sets out to explore how research functions in the art museum, and whether our understanding of research and the researcher needs to change in light of how museums are expected to operate in the twenty-first century. Recognising the need for museums to be open, democratic and discursive spaces, the paper seeks to outline an active role for practice-led research within the gallery, while identifying the value of constructing the museum professional as a practitioner-researcher. We are living in a time when the concept of ‘expertise’ is being publicly questioned and the status of expert knowledge and scholarship is compared, not always favourably, with opinion and personal judgement.1 On social media and increasingly in more mainstream public discourse it is less transparent who has the right to speak with authority on a subject and whose views are to be trusted. Issues such as these are particularly relevant in the context of the art museum, where traditionally expertise has been held unquestionably and exclusively by specific persons within the institution and dispensed to a more or less inexpert public. However, conventional models of museum authority and scholarship are beginning to be tested as the institution’s role is undergoing re-evaluation, shifting from a site of reverence and contemplation to a discursive and democratic space where public debate and the co-construction of ideas by audience and institution is actively sought. Given the emergence of this epistemologically open space, where multiple interpretations of art are encouraged by gallery staff, it is timely to consider how knowledge is generated and sanctioned within the art museum, by whom and for what purpose. This paper emerges from those considerations; specifically it sets out to explore how research, as an activity centred on the creation of new knowledge, functions in the art museum and whether our understanding of research and the researcher needs to change in light of these current trends. It seeks to outline an active role for practice-led research within the gallery, while identifying the value of constructing the museum professional as a practitioner-researcher. The focus here is on a learning department, in part because that is where my knowledge and experience is grounded. The spotlight on learning is also because models of research-led practice that have been adopted within the Tate learning team in London highlight key challenges to re-framing research while, potentially, indicating a way forward across the museum more widely (fig.1). For instance, the process of adopting a research-led approach within learning has raised a number of questions, including: What processes within the museum can legitimately be understood as research? What is the status of knowledge generated through these processes? What are the ambitions for this research activity, in the sense of what values underpin it, who is it for and what does it aim to achieve? And finally, what can be done to support museum professionals who undertake research-led practice? In attempting to address these questions, issues have surfaced which have broader application across the art museum, not least because the process has brought into question some fundamental assumptions, including how we define and ascribe value to research, what do we mean by practice and how can we define the practitioner-researcher. To explore these questions this paper begins by considering how research has traditionally been constructed in the art museum before outlining how ‘practice-led’ or ‘practice-based’ research has been defined in fields relevant to gallery learning. This leads onto an examination of the relationship between practice and theory and the different forms of knowledge associated with each. To understand the ambitions for practice-led research this text addresses why the practitioner-researcher might seek to undertake research; their motivations and desired outcomes. Finally, the paper outlines a particular model of the ‘scholar practitioner’ and examines its relevance within the art museum. The example of the professional working within a learning department is taken as the exemplar throughout the text. One construction of ‘traditional’ research in museums has it focused largely on activity that generates new knowledge relating to the art object and which results in the publication of museum monographs and scholarly texts that appear in periodicals.2 Stemming from the early origins of museums as taxonomic (in the sense of having a responsibility to collect and classify objects) as well as educational institutions, research is seen as the central responsibility of curators who are tasked with advancing knowledge within their field. This knowledge is then shared with the general public through exhibitions catalogues, wall texts and lectures, as well as with the academic community through scholarly texts and conferences, with standards of excellence, rigour and scholarship determined according to strict traditions and criteria tied to the discipline of art history. While there is much that is valuable and admirable about this model (which continues to exist, albeit in a compromised form, in many museums), a number of issues exist with it, not least because of the changing role of the art museum as identified above.3 Nowadays museums are tasked with engaging with broad and diverse publics and generating income; as a consequence, curators today have multiple responsibilities, of which scholarly research is only one. Equally, scholarship for its own sake has been criticised for being elitist and excluding, and models of engaging with the public have shifted toward more inclusive, less didactic models of education.4 No longer is it realistic (if it ever was) for curators to adhere to a role akin to that of a university academic, occupied entirely by scholarly research. Nor is it accurate to see all art museum research as being focused on the art object. Taking Tate as an example, it is apparent that research is conducted across diverse fields – art history, curating, collection care, learning, public policy and museology – and draws on a range of research paradigms and methodologies.5 While the model of research most conventionally adopted within Tate is that of academics and other scholars working in collaboration with museum curators, learning curators and conservators, increasingly it is these museum professionals working across disciplines who are arguing for their practice to be understood as a form of research and for themselves to be identified as researchers in some capacity. This is both because their work in their chosen field (be it conservation, curation or learning programming) includes elements of what can be seen as research, but also because they aspire to undertake research that complements and enhances their professional activities. In the case of learning curators this aspiration has involved a re-evaluation of their expertise and examination of the role of research within this. 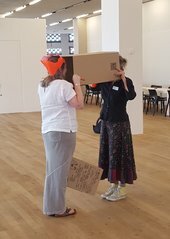 So what is it that gallery learning curators do? Their primary responsibilities include developing and facilitating programmes of activity and modes of interpretation within the gallery (and beyond in the case of outreach projects) and online that support and enhance learning about, with and through art. To accomplish this, these professionals work closely with colleagues across the gallery, notably within curatorial, marketing, digital and visitor experience teams, as well as with partners beyond the art museum (for example with colleagues within universities, schools, the youth sector and children’s centres). Collaboration with artists in central to learning practice within Tate (and other art museums and galleries), as artists are understood to embody and manifest the qualities of creative learning, while also having specific expertise in relation to art that underpins effective pedagogy in the gallery.6 Hence learning curators work closely with creative professionals in devising programmes. Crucially these learning professionals are mindful of the needs, desires and experience of informal gallery visitors and participants in more formal learning programmes and work to ensure that the activities and material offered by the gallery are relevant and engaging to afford the highest quality learning experience. While acknowledging Charman’s point about the need for educators to establish a recognised body of scholarship in the field, in the twelve years since this paper was published much has been accomplished. For example, I established the Tate Research Centre: Learning in 2014 and have been working actively with colleagues within and beyond Tate to generate and disseminate a number of research projects since then.10 This suggests that Charman’s concerns regarding the ‘denial’ of scholarship in art museum education are now hopefully misplaced. Nonetheless, her comments address core issues; how can research and scholarship undertaken by those working in the art museum in fields beyond art history be recognised and validated and how can we account for knowledge generated through the experience of engaging with art. These are challenging and complex issues, but a potential way forward involves looking at models of research that resonate with the experience of learning curators, as practitioner-researchers, within the museum; namely those that are centred on practice itself. The literature on what is variously called ‘practice-led’ and ‘practice-based’ research within education and the creative arts provides a useful starting point for conceptualising gallery learning practice as a form of research. While there are differences in these terms, common to both is a focus on practice being the generator of and focus for research activity. For example, while acknowledging that there are multiple interpretations of these terms, writer Linda Candy has recognised that ‘Practice-based research is an original investigation undertaken in order to gain new knowledge partly by means of practice and the outcomes of that practice’, whereas ‘practice-led research is concerned with the nature of practice and leads to new knowledge that has operational significance for that practice’.11 From my experience of gallery learning activity I see that it involves a combination of both practice-based and practice-led research, as per Candy’s definition. In other words, research-led gallery learning activity involves generating new knowledge both through and about practice. However, for consistency in this paper I will use the term ‘practice-led’ research in describing it. Within arts-related literature there is emphasis on recognising that the processes and methods of enquiry employed within practice can be constructed as forms of research.12 In slight contrast, literature that examines practitioner research within education places greater emphasis on the purposes of research rather than the processes. Attention is drawn, for example, to the significance of practitioners undertaking research to develop reflective practice and to bring about educational change.13 Similarly Alis Oancea and John Furlong recognise that practice-based research in education settings ‘may contribute to theoretical knowledge while at the same time being part of changing practice in a way that is intrinsically worthwhile’ (their emphasis).14 By identifying these two key issues – that practice can be constructed as a form of research and that its purpose is to effect change – practice-led/based research offers a potential model for those working in museums who seek to locate their research in their professional activity, seeing it as a means to generate improvements. At the same time these different constructions of practice-led/based research suggest that any framing of gallery learning practices as research should address the processes and methods of the practice, while also surfacing the values and ambitions underpinning such activity. As described above, gallery learning professionals engage in a range of activities each of which are, to a greater or lesser extent, informed by and produce theory. As such this practice defies conventional definitions that determine that the practitioner is engaged solely in the application of theory, in the actioning of ideas, and is thereby differentiated from the theorist, who is responsible for developing the ideas.15 Similarly, where theory can be perceived as distinct from practice, as a set of abstract ideas about something, it is noticeable that theory, as defined in a range of fields relevant to gallery learning, is understood to be inextricably linked to practice. For example in the realm of art history, theory has been seen to constitute a body of accumulated knowledge which can emerge from and assist in the understanding and development of artistic practice.16 This chimes with Chris Barker’s definition of theory as ‘narratives which seek to distinguish and account for general features which describe, define and explain persistently perceived occurrences’.17 Here the emphasis is on theory emerging from and providing generalised accounts of individual events. But, coming from the field of cultural studies, Barker also acknowledges that theory can be instrumental; it offers ‘new tools by which to think about our world’.18 In this way theory derives from, but also informs actions in the world. This reflexivity argues for a more nuanced framing of theoretical knowledge in relation to practical expertise, since it is the combination of both that advances understanding and brings about change. The suggestion here is that theoretical knowledge is deemed to have the greatest value; hence those professions where this knowledge is predominant are seen to be more prestigious. This acknowledgement of the relative status of different knowledge helps, perhaps, to account for some resistance to recognising the validity of forms of practice-led research in varied contexts.20 But it also suggests the need to reframe the relationship between theory and practice in the gallery, or at least re-examine what theory can encompass, and interrogate how new knowledge is generated. I recognise, as does McClintock, that there exists ‘a hierarchical relationship in which scholarly knowledge derived from theory and research is passed on for practical application in particular situations’ but believe that we need to think more broadly and reflexively about how knowledge can be created.21 Therefore it is helpful to consider how different and more experiential knowledge has value, since it can be seen to shape the status of research and activity undertaken by learning curators and other professionals in the art museum. Research has identified that gallery learning curators have an extensive knowledge base.22 As with other practitioners, in their work they draw on their practical knowledge or ‘knowing how’ which is learnt through experience and expressed only in practice.23 For example, in the case of a learning curator, their direct experience of working with an exhibition or display, and with particular groups in specific spaces for designated periods of time, employing chosen pedagogic strategies, affords them considerable knowledge of what is most successful in supporting people to engage with art. This knowledge is expressed continuously in how they design and facilitate their programmes and activities and how they work with colleagues within and beyond their institutions. However, at the same time, these curators’ actions are informed by their propositional knowledge, or ‘knowing that’, which resembles theory as defined above.24 Indeed, learning curators routinely draw on a wide range of theory, for example art history, philosophy, cultural theory and pedagogy. Significantly, however, the value of this propositional knowledge resides not in and of itself, but rather in how it is deployed. In other words, theory is only useful in terms of how it shapes and improves practice. For example, a learning curator might draw on their knowledge of art history, cultural theory and critical pedagogic theory to design an activity that supports young people to articulate their experiences of racism, inspired by a display of Black British art. In this scenario the learning curator’s familiarity with the Black British art movement, combined with awareness of key ideas on framing a pedagogic environment to give young people agency would inform their planning and execution of the activity. Within such situations it is important that learning curators have the relevant propositional knowledge, but it is vital that they know how to use it to improve their practice. This relationship between practical and propositional knowledge seems to contradict the hierarchy of knowledge alluded to above. For if we understand the effective and competent practitioner to be one whose practical knowledge is sufficiently extensive to enable them to draw on their experiences and on theory equally (but in the latter case as and when it is appropriate to improve their actions), surely it is the former knowledge – their ‘know how’ – which should be primarily recognised and celebrated? Yet, as Charman and McClintock intimate, an epistemological hierarchy does appear to exist and arguably continues to shape research agendas within art museums, determining standards of rigour and excellence that can sit uncomfortably with more practice-led methodologies. Meanwhile, this epistemological relationship also has implications for the types of research that professionals might undertake in the context of the gallery so as to develop their expertise and effect change. There is a need to recognise learning curators’ reflective practice (which does not in itself constitute practice-led research) and build on this in ways that enable them to make their knowledge explicit and public as part of a research community discourse, without necessarily relying exclusively on the written text to do so. For instance, by developing a fuller understanding of the nature of gallery learning practice, it is possible to understand how a workshop or seminar can be seen as the visible manifestation of the learning curators’ knowledge, generated through a rigorous research-led process. Conversely, a film co-produced by an artist, learning curator and group of participants represents the research output generated through a practice-led collaborative research project. Both of these scenarios assume that the learning curators’ research activities can be legitimately practice-led, which suggests that they can be situated as practitioner researchers. Making explicit the motivations of the learning curator enables the link between their work and practice-led research to become apparent. Indeed, as mentioned above, within the learning department at Tate we are committed to what we describe as values-led reflective practice, which resembles aspects of practice-led research. Specifically, this involves framing our programmes in relation to research questions identified by learning curators, which are explored with participants through the programmes and activities. Reflection and evaluation are central to this practice, enabling the learning curator to assess and, if needed, modify their actions according to their findings to constantly improve the quality of their work. We have reached a stage, however, where we see value in formalising these working practices and seek to communicate the skills and knowledge required to be effective in the role. This is in part to make explicit the expertise of the learning curator, but also to enable these practitioners to generate new knowledge and contribute to the body of scholarship for gallery education in rigorous ways that are authentic to their practice. In other words, we seek to find ways to construct them as practitioner researchers. In this way, the scholar practitioner model offers a way of conceptualising and making explicit the work of the learning curator as theoretically informed, ethically motivated and directed toward the social and political as well as the aesthetic. Additionally, the scholar practitioner model outlines what constitutes expertise in ways that resonate with the experience of the gallery learning curator. The ‘expert’ scholar practitioner in any given field possesses a combination of deep understanding of theory and practice knowledge and, compared to those newer in the field, can ‘demonstrate effective, efficient and creative problem solving’.32 Furthermore the expert has the inclination and skills to make that expertise visible to others in ways that are useful; in other words, expert gallery learning curators are not just deploying their knowledge in ways that are of value, but are also developing and sharing their knowledge more widely. Here we return to the need for learning curators to locate their knowledge within a wider public discourse; to disseminate their expertise through text, film and artistic outputs that can include the making of objects. Thus the expert has a range of competences. They know the discipline deeply but they also have ‘scholarly’ skills. These are inherently cross-disciplinary, allowing the scholar practitioner to draw on concepts from varied theoretical perspectives and utilise a range of epistemological and methodological models, which can include constructivist epistemology, experiential pedagogy, action research, as well as ‘expressive/artistic methods’.33 Underlying this model is the understanding that scholar practitioners are continuously learning – their focus is on analysis and reflection leading to new insights and understandings which they then apply to their work and to the wider world. So what would it mean for the art museum if learning curators (and potentially other professionals such as exhibition curators and conservators) working within it were framed as scholar practitioners? For a number of reasons I believe that this would be a positive step. The model allows for an authentic representation of the learning curator’s expertise, combining both practical and theoretical knowledge. It acknowledges the ethical motivations for undertaking the generation of new knowledge, enabling the link to be made with a values-led approach. It welcomes cross-disciplinarity in terms of research, thereby opening up the institution to different research paradigms and challenging hierarchies of knowledge. It suggests there is no right way to undertake research except that it achieves the most effective outcome. It recognises that research practices within the art museum operate within wider cultural and social contexts (which corresponds with how the museum in the twenty-first century operates). Finally, it allows for work with others, while acknowledging the specific expertise of the practitioner within the institution. Significantly, the scholar practitioner model outlines an alternative in terms of standards of rigour and excellence by which to assess the research. These criteria resonate with those outlined by others in relation to practice-based/led research.34 Authenticity, trustworthiness, utility and praxis are cited as the standards by which excellence in research by the scholar practitioner should be assessed.35 And while not all research needs to adhere to this approach (without question there is a need, for example, for research on the collection and on gallery pedagogy that is undertaken by academic scholars and researchers who are not practitioners), the scholar practitioner model does appear to provide a way of broadening our understanding of what constitutes legitimate research within the art museum and who is qualified to undertake it. It provides a means by which to construct the practitioner researcher in the art museum, one that recognises their skills and expertise and outlines relevant research processes and outcomes that are rigorous, relevant and manageable. In this paper, I have outlined how the expertise of the gallery learning curator is constructed variously from practical and propositional knowledge, and drawn attention to how this plays out in a model of values-led, practice-led research. Broadening out from ‘traditional’ conceptions of research in the gallery, this form of enquiry has a primary aim to effect change within individuals and the institution and operates collaboratively, drawing on a range of methodologies. The expert gallery learning curator has the necessary skills and knowledge to make effective decisions in good practice. This is alongside the ability to interrogate and reflect on the practice (through ongoing reflection and more formally through designated research projects) and make individual knowledge explicit by developing theory and sharing ideas more widely. These individuals, therefore, have significant responsibilities ­– to work in principled ways to generate new knowledge for themselves and others that is trustworthy, authentic and of use. In the museum of the twenty-first century, whose authority is no longer unquestioned, these skills and responsibilities are essential. 1. During the EU referendum campaign in 2016 the British politician Michael Gove famously said ‘I think the people of Britain have had enough of experts’. 2. R.G.W. Anderson, ‘To Thrive or Survive? The State and Status of Research in Museums’, Museum Management and Curatorship, vol.20, no.4, 2005, pp.297–311. Anderson differentiates ‘traditional’ research in museums from audience research, social studies and research conducted in research laboratories, none of which he considers core to the research function of the museum. 4. David Fleming, (2002). ‘Positioning the Museum for Social Inclusion’, in Richard Sandell (ed. ), Museums, Society, Inequality, London 2002, pp.213–24. 5. See www.tate.org.uk/research for evidence of the wide range of research activity across Tate. 6. Further examinations of the rationale for working with artists can be found in Emily Pringle, ‘The Artist as Educator: Examining Relationships between Art Practice and Pedagogy in the Gallery Context’, Tate Papers, no.11, Autumn 2009, http://www.tate.org.uk/research/publications/tate-papers/11/artist-as-educator-examining-relationships-between-art-practice-and-pedagogy-in-gallery-context, accessed 23 April 2018; and Anna Cutler, ‘What Is To Be Done, Sandra? Learning in Cultural Institutions of the Twenty-First Century’, Tate Papers, no.13, Spring 2010, http://www.tate.org.uk/research/publications/tate-papers/13/what-is-to-be-done-sandra-learning-in-cultural-institutions-of-the-twenty-first-century, accessed 23 April 2018. 7. See Maria Xanthoudaki, Les Tickle and Veronica Sekules (eds. ), Researching Visual Arts Education in Museums and Galleries, London 2003. 8. For example, in their 2008 exploration of issues of quality in applied and practice-based research in education, Alis Oancea and John Furlong identify recurring preconceptions regarding teachers’ ability to conduct rigorous research of sufficient quality owing to a misconception of their knowledge base. See Alis Oancea and John Furlong, ‘Expressions of Excellence and the Assessment of Applied and Practice-Based Research’ in Alis Oancea and John Furlong (eds. ), Assessing Quality in Applied and Practice-Based Research in Education, London 2008, pp.1–20. 9. Helen Charman, ‘Uncovering Professionalism in the Art Museum: An Exploration of Key Characteristics of the Working Lives of Education Curators at Tate Modern’, Tate Papers, no.3, Spring 2005, http://www.tate.org.uk/research/publications/tate-papers/03/uncovering-professionalism-in-the-art-museum-exploration-of-key-characteristics-of-the-working-lives-of-education-curators-at-tate-modern, accessed 23 April 2018. 10. See www.tate.org.uk/research/research-centres/learning-research, accessed 23 April 2018. 11. Linda Candy, Practice Based Research: A Guide, 2003, p.7, https://www.creativityandcognition.com/resources/PBR%20Guide-1.1-2006.pdf, accessed 23 April 2018. 12. See, for example, Estelle Barrett and Barbara Bolt (eds. ), Practice as Research: Approaches to Creative Arts Enquiry, London 2010; Candy 2003; Robin Nelson, Practice as Research in the Arts: Principles, Protocols, Pedagogies, Resistances, London 2013; Hazel Smith and Roger T. Dean, Practice-Led Research, Research-Led Practice in the Creative Arts, Edinburgh 2009. 13. Marianne Coleman and Jacky Lumby, ‘The Significance of Site-Based Practitioner Research in Educational Management’ in David Middlewood, Marianne Coleman and Jacky Lumby (eds. ), Practitioner Research in Education: Making a Difference, London 1999, pp.1–19. 14. Oancea and Furlong 2008, p.8. 15. For example, the Oxford English Dictionary defines practice as ‘the actual application or use of an idea, belief, or method, as opposed to theories relating to it’, The Concise Oxford Dictionary, Oxford 1979. 16. Jonathan Harris, Art History: The Key Concepts, London 2006. 17. Chris Barker, Cultural Studies: Theory and Practice, London 2000, p.33. 19. Charles McClintock, ‘Scholar Practitioner Model’ in Anna Distefano, Kjell Erik Rudestam and Robert J. Silverman (eds. ), Encyclopedia of Distributed Learning, London 2004, http://sk.sagepub.com/reference/distributedlearning/n134.xml, accessed 23 April 2018. 20. For example, Hazel Smith and Roger T. Dean describe how in the last two to three decades creative practitioners have been developing practice-led research ‘for political purposes within higher education, research and other environments, to explain, justify and promote their activities, and to argue – as forcefully as possible in an often unreceptive environment – that they are as important to the generation of knowledge as more theoretically, critically or empirically based research methods’. See Smith and Dean 2009, p.2. 21. McClintock 2004, http://sk.sagepub.com/reference/distributedlearning/n134.xml, accessed 23 April 2018. 22. See Charman 2005, http://www.tate.org.uk/research/publications/tate-papers/03/uncovering-professionalism-in-the-art-museum-exploration-of-key-characteristics-of-the-working-lives-of-education-curators-at-tate-modern, accessed 23 April 2018; and Pringle 2009, http://www.tate.org.uk/research/publications/tate-papers/11/artist-as-educator-examining-relationships-between-art-practice-and-pedagogy-in-gallery-context, accessed 23 April 2018. 23. See Michael Eraut, Developing Professional Knowledge and Competence, London 1994. 25. See Oancea and Furlong 2008. 26. Emily Pringle and Jennifer DeWitt, ‘Perceptions, Processes and Practices around Learning in an Art Gallery’, Tate Papers, no.22, Autumn 2014, http://www.tate.org.uk/research/publications/tate-papers/22/perceptions-processes-and-practices-around-learning-in-an-art-gallery, accessed 23 April 2018. 27. See Emily Pringle (ed. ), Transforming Tate Learning, 2015, http://www.tate.org.uk/download/file/fid/30243, accessed 23 April 2018. 29. Felicity Allen, ‘Situating Gallery Education’, 2008, http://www2.tate.org.uk/tate-encounters/edition-2/tateencounters2_felicity_allen.pdf, accessed 23 April 2018. 30. McClintock 2004, http://sk.sagepub.com/reference/distributedlearning/n134.xml, accessed 23 April 2018. 34. For example, Oancea and Furlong’s (2008) domains of quality for applied and practice-based research in education include trustworthiness, plausibility, fitness to purpose, transparency and advancement of knowledge. See Oancea and Furlong 2008, p.5. Emily Pringle, ‘Developing the Practitioner-Researcher Within the Art Museum’, in Tate Papers, no.29, Spring 2018, https://www.tate.org.uk/research/publications/tate-papers/29/developing-practitioner-researcher-within-art-museum, accessed 22 April 2019.